Most (though not all, see Mott insulator) insulators have a large band gap. This occurs because the "valence" band containing the highest energy electrons is full, and a large energy gap separates this band from the next band above it. There is always some voltage (called the breakdown voltage) that gives electrons enough energy to be excited into this band. Once this voltage is exceeded the material ceases being an insulator, and charge begins to pass through it. However, it is usually accompanied by physical or chemical changes that permanently degrade the material's insulating properties. A very flexible coating of an insulator is often applied to electric wire and cable, this is called insulated wire. Wires sometimes don't use an insulating coating, just air, since a solid (e.g. plastic) coating may be impractical. However, wires that touch each other produce cross connections, short circuits, and fire hazards. In coaxial cable the center conductor must be supported exactly in the middle of the hollow shield to prevent EM wave reflections. Finally, wires that expose voltages higher than 60 V can cause human shock and electrocution hazards. Insulating coatings help to prevent all of these problems. Dirt, pollution, salt, and particularly water on the surface of a high voltage insulator can create a conductive path across it, causing leakage currents and flashovers. The flashover voltage can be reduced by more than 50% when the insulator is wet. High voltage insulators for outdoor use are shaped to maximise the length of the leakage path along the surface from one end to the other, called the creepage length, to minimise these leakage currents. To accomplish this the surface is moulded into a series of corrugations or concentric disc shapes. These usually include one or more sheds; downward facing cup-shaped surfaces that act as umbrellas to ensure that the part of the surface leakage path under the 'cup' stays dry in wet weather. Minimum creepage distances are 20–25 mm/kV, but must be increased in high pollution or airborne sea-salt areas. Pin type insulator - As the name suggests, the pin type insulator is mounted on a pin on the cross-arm on the pole. There is a groove on the upper end of the insulator. The conductor passes through this groove and is tied to the insulator with annealed wire of the same material as the conductor. Pin type insulators are used for transmission and distribution of communications, and electric power at voltages up to 33 kV. 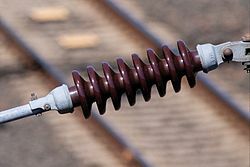 Insulators made for operating voltages between 33kV and 69kV tend to be very bulky and have become uneconomical in recent years. Post insulator - A type of insulator in the 1930s that is more compact than traditional pin-type insulators and which has rapidly replaced many pin-type insulators on lines up to 69kV and in some configurations, can be made for operation at up to 115kV. Suspension insulator - For voltages greater than 33 kV, it is a usual practice to use suspension type insulators, consisting of a number of glass or porcelain discs connected in series by metal links in the form of a string. The conductor is suspended at the bottom end of this string while the top end is secured to the cross-arm of the tower. The number of disc units used depends on the voltage. Strain insulator - A dead end or anchor pole or tower is used where a straight section of line ends, or angles off in another direction. These poles must withstand the lateral (horizontal) tension of the long straight section of wire. To support this lateral load, strain insulators are used. For low voltage lines (less than 11 kV), shackle insulators are used as strain insulators. However, for high voltage transmission lines, strings of cap-and-pin (suspension) insulators are used, attached to the crossarm in a horizontal direction. When the tension load in lines is exceedingly high, such as at long river spans, two or more strings are used in parallel. Shackle insulator - In early days, the shackle insulators were used as strain insulators. But nowaday, they are frequently used for low voltage distribution lines. Such insulators can be used either in a horizontal position or in a vertical position. They can be directly fixed to the pole with a bolt or to the cross arm. Bushing - enables one or several conductors to pass through a partition such as a wall or a tank, and insulates the conductors from it. Higher voltage transmission lines usually use modular suspension insulator designs. The wires are suspended from a 'string' of identical disc-shaped insulators that attach to each other with metal clevis pin or ball and socket links. The advantage of this design is that insulator strings with different breakdown voltages, for use with different line voltages, can be constructed by using different numbers of the basic units. Also, if one of the insulator units in the string breaks, it can be replaced without discarding the entire string. The invention of suspension-type insulators made high-voltage power transmission possible. As transmission line voltages reached and passed 60,000 volts, the insulators required become very large and heavy, with insulators made for a safety margin of 88,000 volts being about the practical limit for manufacturing and installation. Suspension insulators, on the other hand, can be connected into strings as long as required for the line's voltage. These insulators also have to be equipped with overvoltage protection equipment. For the dimensions of the guy insulation, static charges on guys have to be considered. For high masts, these can be much higher than the voltage caused by the transmitter, requiring guys divided by insulators in multiple sections on the highest masts. In this case, guys which are grounded at the anchor basements via a coil - or if possible, directly - are the better choice. In older apparatus made up to the early 1970s, boards made of compressed asbestos may be found; while this is an adequate insulator at power frequencies, handling or repairs to asbestos material can release dangerous fibers into the air and must be carried cautiously. Wire insulated with felted asbestos was used in high-temperature and rugged applications from the 1920s. Wire of this type was sold by General Electric under the trade name "Deltabeston." Flexible insulating materials such as PVC (polyvinyl chloride) are used to insulate the circuit and prevent human contact with a 'live' wire – one having voltage of 600 volts or less. Alternative materials are likely to become increasingly used due to EU safety and environmental legislation making PVC less economic. Class 2 insulation means that the device is double insulated. This is used on some appliances such as electric shavers, hair dryers and portable power tools. Double insulation requires that the devices have both basic and supplementary insulation, each of which is sufficient to prevent electric shock. All internal electrically energized components are totally enclosed within an insulated body that prevents any contact with "live" parts. In the EU, double insulated appliances all are marked with a symbol of two squares, one inside the other. ^ Klein, N.; Gafni, H. (1966). "The maximum dielectric strength of thin silicon oxide films". IEEE Trans. Electron Devices. 13. ^ Inuishi, Y.; Powers, D.A. (1957). "Electric breakdown and conduction through Mylar films". J. Appl. Phys. 58. Bibcode:1957JAP....28.1017I. doi:10.1063/1.1722899. ^ Belkin, A.; et., al. (2017). "Recovery of Alumina Nanocapacitors after High Voltage Breakdown". Scientific Reports. 7. Bibcode:2017NatSR...7..932B. doi:10.1038/s41598-017-01007-9. ^ "Electrical Porcelain Insulators" (PDF). Product spec sheet. Universal Clay Products, Ltd. Retrieved 2008-10-19. ^ Holtzhausen, J.P. "High Voltage Insulators" (PDF). IDC Technologies. Retrieved 2008-10-17. ^ IEC 60137:2003. 'Insulated bushings for alternating voltages above 1,000 V.' IEC, 2003. ^ "Insulators : National Insulator Association Home Page". www.nia.org. Retrieved 2017-12-12. ^ "Understanding IEC Appliance Insulation Classes: I, II and III". Fidus Power. 6 July 2018. Wikimedia Commons has media related to Electric insulators.